Glossostigma elatinoides from Australia is popular Japanese-inspired planted tanks. 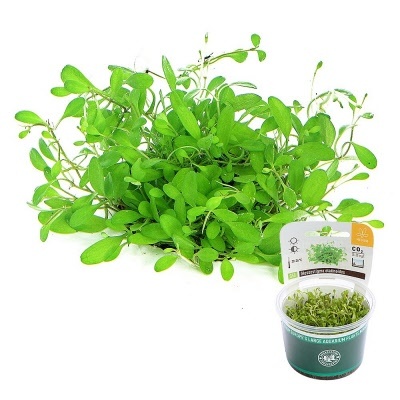 It is one of the smallest aquatic plants (3-5 cm tall), so it makes an excellent foreground plant. This species can be challenging to grow with good form. 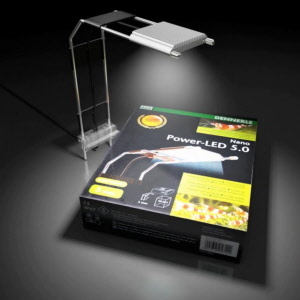 It demands a lot of light and grows spindly if the lighting is inadequate. Be sure to keep bigger plants from overshadowing it. We recommend you plant the cuttings about one or two inches apart to help the plants grow together more quickly. Encourage growth by fertilizing with CO2 and keeping the water values softer. In Vitro specimens are submersed in 100 percent humidity. Many freshwater plantlets available are emersed, which means the leaves are above the water. These plants die back when they are planted within an aquarium, and they regrow with the new leaves looking different than they did when they were purchased. With InVitro submerged plantlets, you get uniform, uninterrupted growth. Another benefit to the culture cups is that they contain many small plantlets that can be divided out and spread throughout your aquascape, so you get tremendous value for the price. <?xml:namespace prefix = "o" />Note: No international shipping available for this item.